So This was the scene this weekend. Four passengers my wife, five year old son, 6 month old son and I. We got hit at well its hard to estimate, it felt like we were bounced across the road. My five year old was sat at the point of impact and hit his head on the window. Before I continue. Everyone is fine. All of us, my son does have a small bump on his head but he’s had worse, I have a pain in the neck but how that was caused I can’t say. The other party phoned the police and someone went to the fire station and informed them there was a crash nearby involving a baby. So after both of those it was bedlam, we had three police cars turn up (one went later) and a fire engine and an ambulance. It was a little overkill but I was amazed and pleased at the speed of response we got. The fire peeps must have not had another call to go to as they spent time checking everyone over before the paramedics arrived and our car to see if its drivable, or leaking! Then one of the guys asked our little boy if he wanted to see in the fire engine. He went in the back and saw the breathing things and they put the mask on him. Which I have to admit was a really nice touch as he was really shook up by the whole thing and later said this was the worst day of his life. So the services later dissipated and left us with the police and they took details and we drove back home. 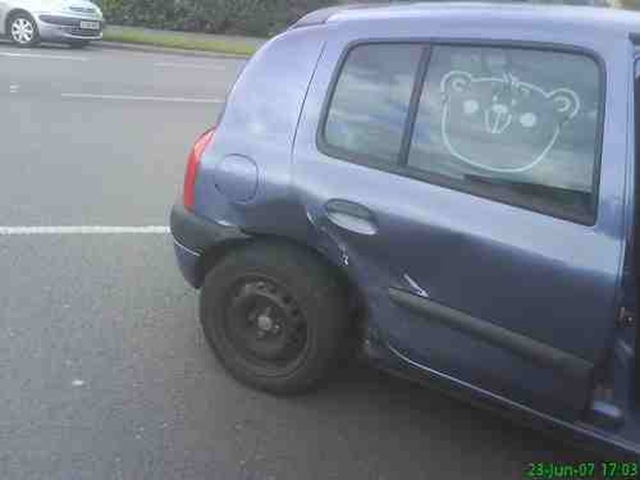 So I wonder what the NCAP rating for an Y reg clio. Considering the force of the impact and the amount of damage I’d say it was favourable. I wonder If it would be better in my ’03 Mondeo (yes I own a ford and I love it (well this version the last version I despised)). I think I can be thankful for ever increasing car safety. I can be thankful it was a small car that hit us and not a huge truck (for those who say SUV, its a bloody truck). I can be thankful for the emergency services. I can be thankful everyone is ok.
Will I be thankful for insurance companies is to be seen.